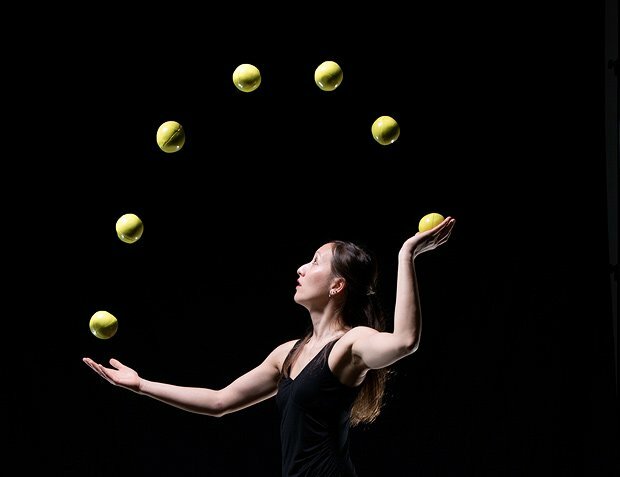 In the nimble hands of the Gandinis, juggling always falls more in line with choreography than circus stunts. Two years ago the company collaborated with Scottish Ballet in 4 x 4 Ephemeral Architectures. Before that, homage to Pina Bausch Smashed saw a cast of nine destroy a tea-set's worth of crockery every night in a chaotic finale. Chaos is present in Sigma too, which turns to the rhythms and lines of Bharatanatyam dance – a South Indian classical dance rich in intricate hand movements – to riff and balance with juggling. But it's a chaos of a subtle and sophisticated kind, in a piece that is broken down neatly into 12 segments, while at the same time fluid, segueing through peaks and troughs of tempo, patterns both dense and sparkling, minimal and sinuous. The four performers – Gandini co-founder Kati Ylä-Hokkala, Bharatanatyam choreographer Seeta Patel, dancer Indu Panday and juggler Kim Huynh – stagger introductions to themselves throughout the show. These are complete with the dates and places of the birth of their parents; a plotting in time and space of the lines reaching backwards and intersecting human lives. This sense of interconnectivity, that everything can be read as a pattern, channels a current through the show that is quietly mesmerising. Juggling balls seem to travel horizontally across vertical lines, spotlit hands produce an infinite variation of geometries and melt in and out of holding a red ball, connections are drawn between Bob Fosse's jazz choreography and Bharatanatyam postures. Underscoring it all is music with mathematical structures – electro pips, metallic percussion, Bach's Goldberg Variations. If all this makes it sound terribly conceptual, Sigma's simple beauty and playful tone reaches beyond its complicated ideas. On the way out a tiny girl toddles up to Patel. 'I love your dancing!' she cries. Assembly Hall, until 28 Aug (not 9, 14, 21), 1.30pm, £10–£12. A mix of juggling, geometry and classical Indian dance.